Terraforming Mars is one of the most popular heavy strategy games of the last two years (read our 2016 review); it earned a nomination for the Kennerspiel des Jahres (experts “game of the year”), losing to the very good but much simpler Exit: The Game series. Its currently ranked #4 on BoardGameGeeks master ranking of all board games, a ranking that tends to skew towards complex games that eschew luck in favor of strategy and engine building. Players in Terraforming Mars are trying to, well, terraform Mars—and rack up the most points while doing so. All players contribute to three common goals around the terraforming effort: increasing the planets surface temperatures to eight Celsius, increasing the atmospheric oxygen levels to 14 percent, and placing nine ocean tiles on the board. Players get two actions per turn, and rounds (called “generations”) continue until all players have passed. Most actions involve playing cards from your hand that increase your abilities, give you one-time rewards, increase one of those three common variables, or sabotage an opponent. 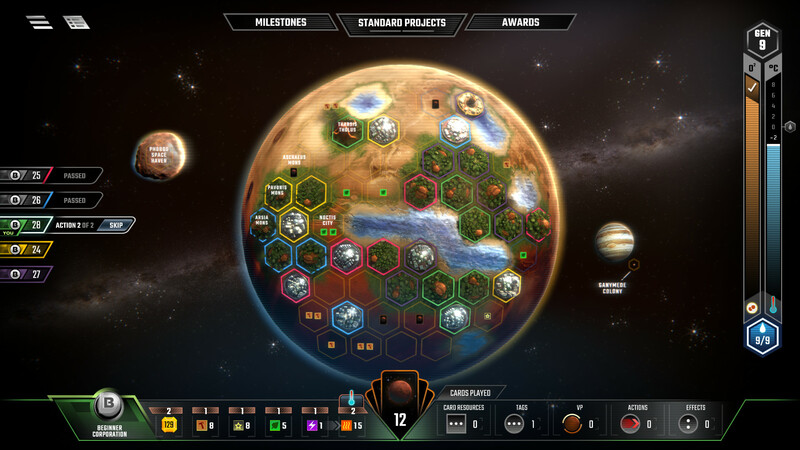 Players get income each turn based on their terraforming index, which they can increase by bumping up any of the three terraforming variables or by playing specific cards. At the start of each round, players receive four cards at random from the deck and can buy any or all of them for three megacredits (stylized as M€) each. Play continues until the players achieve all three terraforming goals or the 15th round is complete. A ton of information is involved in Terraforming Mars, and once again the folks at Asmodee Digital have done a solid job of making everything available to players without cluttering the screen. Your six resources are shown on the left side of the bottom info bar, while additional actions, your in-game victory point count, your played card tags (types), and information on special corporation effects are available on the right. You can easily see what cards youve already played; cards in Terraforming Mars have a lot of text, so youll usually have to click the card and then click through to get to the full text to see any cards entire list of effects. When you get enough plants or heat to convert those into a greenery tile or into an increase in the surface temperature, theres a little pop-up above those resources, small but clearly visible. The top bar, which I admit I didnt notice until well into my first game in the app, also allows you to see milestones and awards, of which up to three can come into play in any game once a player achieves them and uses an action to fund one. The biggest flaw in the current release is that theres no undo function anywhere, even though you get two actions per turn and thus should have at least some ability to roll back certain moves. The app includes the goofy text from the physical cards in a pop-up you get when you click on a card, which pushes some of the critical information on how the card works on to a second screen you access by clicking a small i on the card. Forgetting that you have unique actions available to you is a little too easy—a dialog reminding you of those options when you hit Pass would be useful. I also found the app more user-friendly when I set the animation speed to Fast and turned off the movement of the planet on the screen. The app has a solo mode that is probably its best feature, although it too could use some modest tweaks to improve the user experience. Its a heck of a challenge: you get 15 generations (rounds) to terraform the red planet by reaching the same three thresholds that apply to the base game. If you get the temperature up to eight Celsius, the oxygen level to X percent, and place nine ocean tiles, you win; if you miss any of those three targets, you lose. Terraforming does keep score, so you can compare how you did across plays, but I found it enough of a challenge to just beat the thing that I didnt have any spare time to worry about racking up points. You get your choice of two corporations at the start of the game—I won with Ecoline, if youre interested—and then play proceeds more or less as normal. There are two neutral cities on the board, and if you play a card that tells you to take something from another player, you just take it from the neutral player, which is as good as ignoring that part of the card. Even if you intend to use the multiplayer function or play the AI, the solo challenge is a great way to develop your engine-building strategies, because you get very little slack; if you dont start early, youre not going to finish all three goals. When I did finally win, it took a card (Deimos: “We werent using that moon anyway”) that let me bump up the temperature three ticks, plus another 14 Martian bucks to get it the last tick up to the top of the thermometer. Theres still no undo function in solo mode, which is absurd for a solo game as long as you havent revealed any hidden information (which in this game only includes card draws). The end-game screen only says YOU WIN! or YOU LOSE! with your point total, without showing how close you came to hitting all three targets. The Terraforming Marsapp is $24.99 on Steam, which is still half what youd pay for the physical game. The current version, which has already had a few bug fixes, has run steadily for me through a dozen or more plays without glitches or any glaring mistakes in game play. The main thing missing from the app that you get with the cardboard experience is the drafting variant. With this variant in play, you acquire cards via a card-drafting mechanism instead of getting them at random; this set-up can make the game a bit longer but further reduces the randomness of the deck. Its a big deal to serious Terraforming Mars players, and Asmodee Digital has promised the feature as a December update. For relative novices like me—I have played the physical game just a few times, and playing the app was almost like learning the game from scratch—the digital version is a great learning tool, fun to play on its own, and offers AI options good enough to help you hone your game.